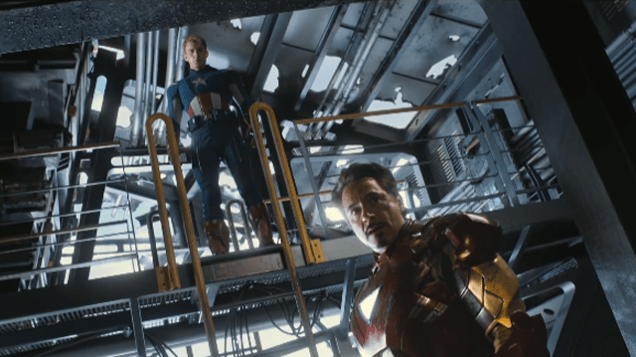 Further to its teaser, Samsung has released a limited edition of its Galaxy S6 Edge in the distinctive red-and-gold livery of Marvel superhero Iron Man, as a promotion for Avengers: Age of Ultron. The 64GB model features red brushed metal body accented with gold along the peripheral frame as well as around the camera lens and home button, and comes packaged with an “arc reactor” wireless charging pad. The Iron Man theme continues with a special skin to spice up the UI experience. However, the lack of J.A.R.V.I.S. leaves a conspicuous absence, with only Google Now to make up for it. First releasing in South Korea on May 27, the phone will make its way to China and Hong Kong in June. In the meanwhile, watch the unboxing video below. With the upcoming release of Marvel‘s Avengers: Age of Ultron fast approaching, Taiwanese toy maker Beast Kingdom Toys presents a life-sized statue of the Hulkbuster figurine selling for $21,500 USD. Standing at an impressive height of nine feet and ten inches, the Hulkbuster figure is a movie-accurate depiction of Tony Stark’s special suit, which he utilizes to tame the mercurial Hulk. Affixed onto a gray stone platform, the Hulkbuster statue features a built-in LED light system, adding to the realistic effect as a vibrant crimson and gold coating accentuates the detailed mechanical construction and aesthetic. Head over to Beast Kingdom Toys online site for more info and anticipate the theater release of Marvel’s Avengers: Age of Ultron on May 1. This past weekend’s box office numbers are in, and Disney’s latest project Big Hero 6 stands soundly on top. This might not come as a big surprise, considering that Frozen-fever is still holding every auntie’s TV hostage – but the film still breaks ground, especially in the scope of Asian Americans in cinema. And Hollywood should take note. Big Hero 6 is a robotic sci-fi tale that revolves around Hiro Hamada, Disney’s first explicitly mixed-heritage protagonist. 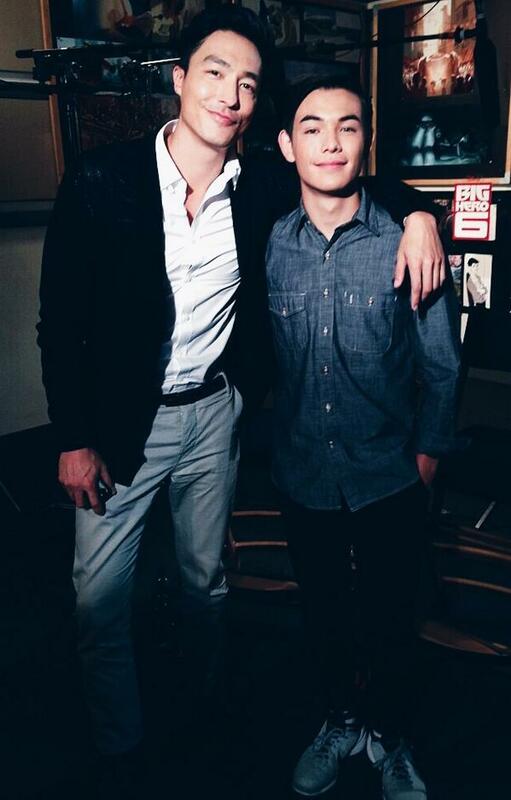 Hamada is voiced by Ryan Potter, who is of Japanese and Caucasian descent himself. 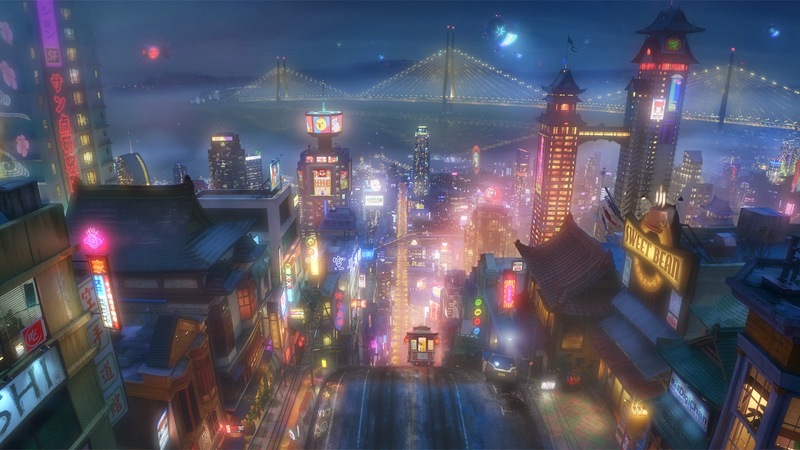 In fact, the entire film is placed in a “Hapa environment” of sorts, set in San Fransokyo, an architectural and cultural hybrid of the cities the name references. Casting Asian Americans isn’t new to Disney, whose Mulan in 1998 was voiced by Ming-Na Wen, BD Wong and George Takei, among others. Still, the studio has been inconsistent when it comes to this matter – the lead role in Lilo & Stitch wasn’t voiced by a Hawaiian (or an Asian Pacific American, for that matter), and we’d have to go as far back as Aladdin or even The Jungle Book to locate another Disney animation starring characters from a broader Asian origin (let’s pretend the Siamese Cats from Lady and the Tramp never happened). Among those mentioned films, the only voice actor of Asian descent was Lea Salonga for Princess Jasmine’s singing parts. So while Big Hero 6 is a fictitious metropolis which never reveals what country it’s actually in, its cultural mash-up of settings, characters and themes means it could very well be Disney’s first Asian/American film that actually stars Asian American actors. Hollywood’s reputation for placing white actors in Asian roles is a tale as old as time – from Goku in Dragonball: Evolution to Aang in The Last Airbender, glossing over the past century of Asian roles in American film would show little progress since Paul Muni and Luise Rainer donned yellowface in 1937’s The Good Earth. The track record for animation hasn’t been fantastic either, with white actors playing the lead roles in both Avatar series’ and the English dubs for Dragonball Z and Pokemon (I just ruined my childhood going through those links, BTW. You’re welcome). ’m not the only one who has been griped by this cinematic phenomenon. When 2010’s The Last Airbender revealed an all-white cast (minus Dev Patel as the villain, of course), it caused such an uproar that an entire website called Racebending was launched against the production, and multiple petitions continue to call for a reboot of the franchise. Director M. Night Shyamalan, who’s Indian American himself, seemed aloof about the matter, insisting that the diversity of the cast and crew was on par with the United Nations. Those who have tried to actually find logic in prioritizing white actors in these roles have eluded to Asian and Asian American actors having less audience appeal than white actors, despite the fact that these films have failed among critics and fans alike. Enter Big Hero 6, adapted from an obscure Marvel series about a Japanese counterpart to the Avengers. Unlike other Marvel titles like X-Men – which has an existing fanbase, or other Disney films like Maleficent – which is based on a childhood classic, Big Hero 6 relies on Disney’s promotion engine and, more importantly, its characters and storyline. Merely being a Disney film hasn’t always been a shoe-in (anyone watching The Rescuers: Down Under tonight? ), but critics and audiences have been singing this one’s praises since it opened at the Tokyo International Film Festival late last month. 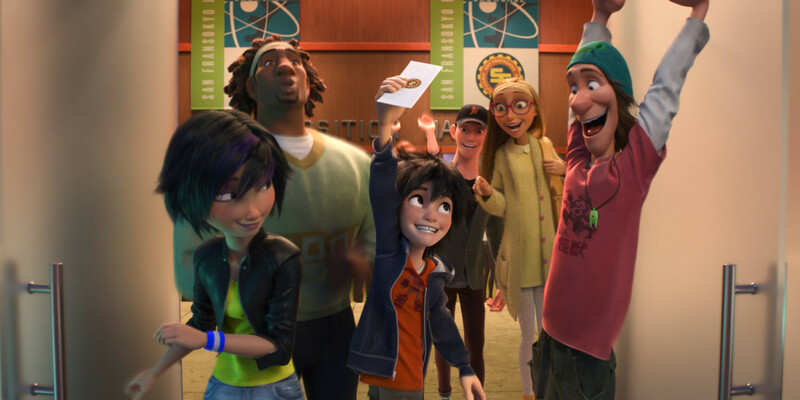 Debuting an awesome cartoon about Asians in the land known for cranking out awesome cartoons about Asians is a tough job for anyone, but Big Hero 6‘s ability to exhibit cultural tropes between America and Japan without being overly cheesy or offensive was impressive even to a cinema Grinch like me. Sure, I scoffed a bit at the pagoda-topped Golden Gate Bridge, but I also couldn’t help but feel validated to hear someone on the big screen say “red bean paste” as casually as one would say “hot dog.” The cast is diverse enough to make me suspect at least one member of the talent scout was a former member of the Third World Liberation Front – Potter, along with Daniel Henney, Jamie Chung, Damon Wayans, Jr. and Génesis Rodríguez make T.J. Miller and Scott Adsit’s roles the only two not filled by an actor of color. 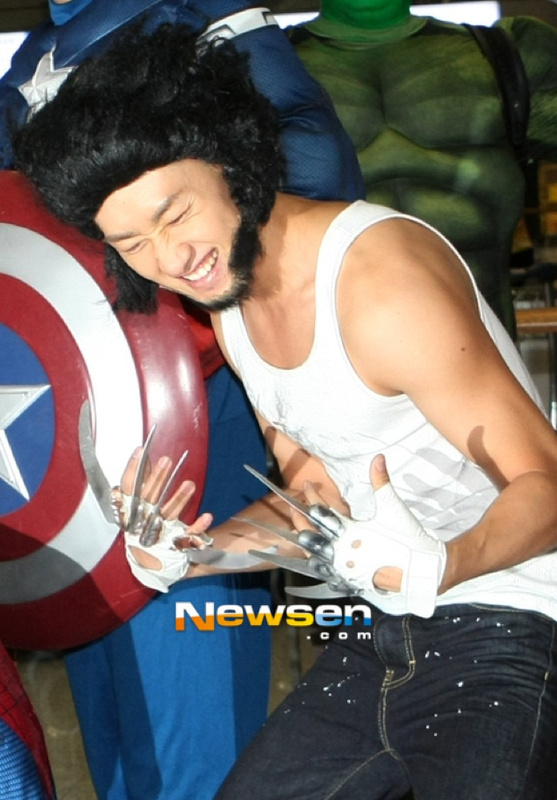 Last weekend, filming began in Seoul for The Avengers: Age of Ultron. Mapo Bridge was closed to traffic for the production. Below the bridge, a body was discovered floating in the water. 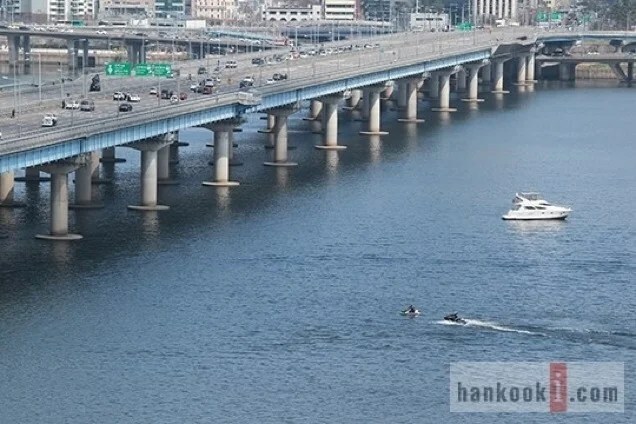 Naver (via tipster Sang) has photos of the bridge during the filming on March 30. As previously mentioned, the bridge was closed to traffic from 6:00am to 5:30pm. This was the first time Mapo Bridge has ever been shut down for a movie. 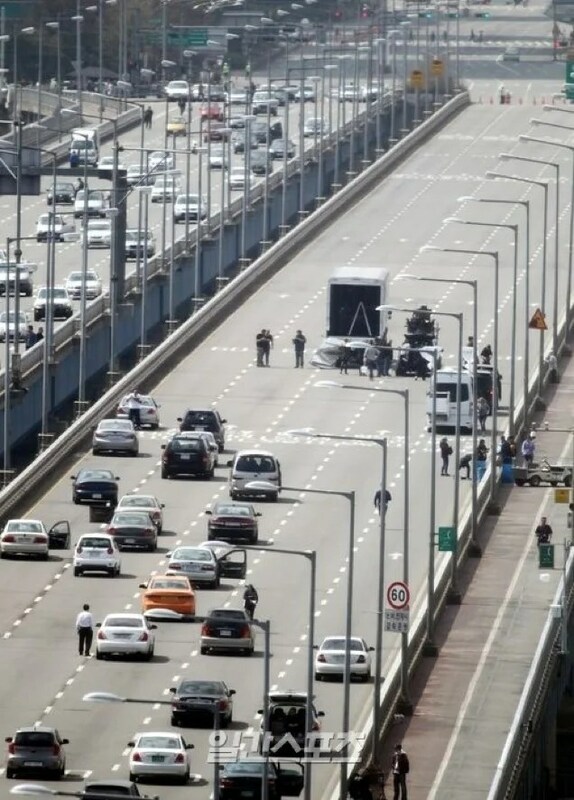 Here is a photo of the filming, which used over a hundred cars as props on the bridge. Security was tight on set. 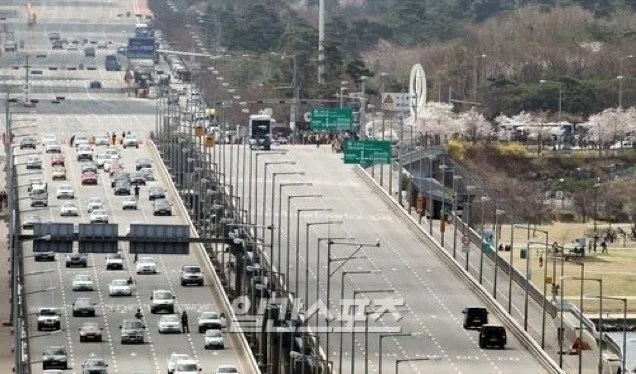 According to News 1, there were well over a hundred private security guards, 160 South Korean police officers, and numerous volunteers. The set was locked down so tight that it was hard to get a close-up glimpse. The renovations did little to deter suicides, with the number of attempted suicides actually increasing. 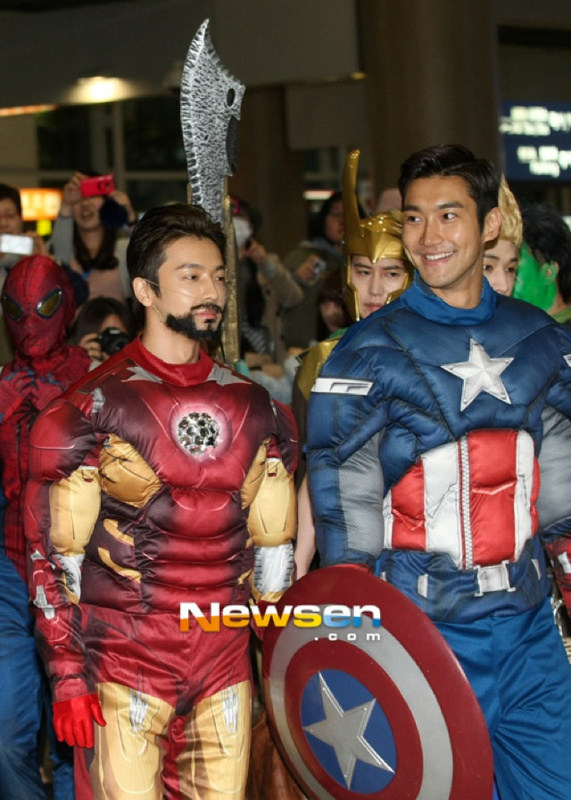 As far as South Korean boy bands go, Super Junior is about as big as they come. 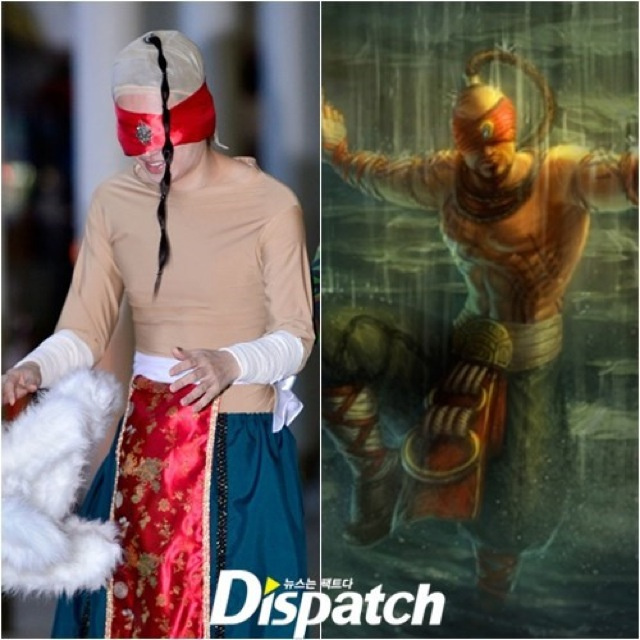 And if their music wasn’t enough to win you over, have you seen their cosplay? 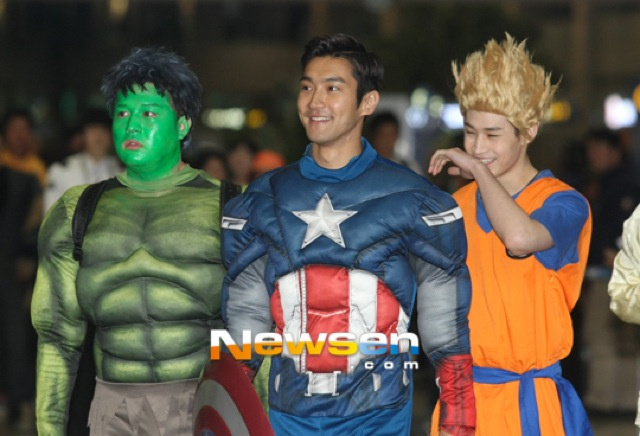 To celebrate Super Junior‘s 8th anniversary, the group’s members decided to cosplay. Getting ready to leave for a concert in Mexico, the group even went to the airport in costume. The group has done this before—for the fans, really. 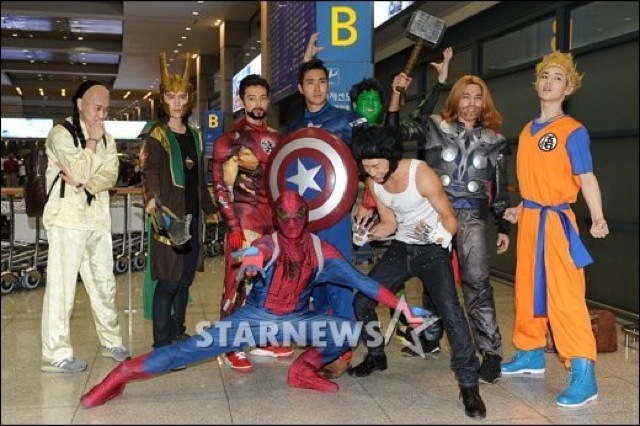 Below, you can see them in Avengers and Dragonball cosplay from when they were arriving back in South Korea.